I have an abundance of oregano and chive blossoms in the herb garden at the moment. I'm drying some oregano, using some fresh, and planning to let some flower for the bees. The chives we use fresh and while I do infuse some vinegar with chive blossoms, there's only a need for so much honestly. The meal plan for the week included soup for lunch and I wanted a little something to go alongside it so these Chive Blossom Oregano Corn Muffins were born. For these muffins, I did indeed use just the chive blossoms. Simply pull the flowers from the stem and put them in a bowl to add to the muffin batter. The chopped green bits of the chives would work well too in the absence of the blossoms. 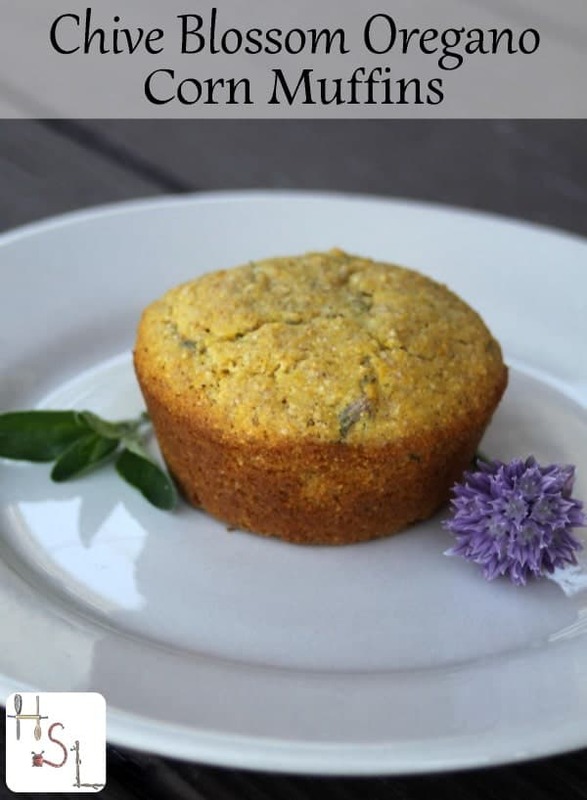 The blossoms add a delightful bite to the muffins while also imparting a little color and texture but again use any bits of the chive plant. Like most corn bread, these muffins are quite good warm and slathered in butter. They freeze alright but tend to dry out quickly so keep that in mind if you toss them in the freezer for later. This isn't terrible, however just slather in more butter or dip into a bowl of soup and no one will mind or save for cornbread dressing that one. Use garden fresh herbs for a delightful side dish to salads and soups with these easy to whip up chive blossom oregano corn muffins. Whisk together the flours, cornmeal, baking powder, sugar, and salt. Set aside. Whisk together the melted butter or oil, egg, and milk until thoroughly combined. Pour the wet ingredients into the dry and stir until almost combined. Add the chive blossoms and oregano. Stir until thoroughly combined (it's okay if there are are few lumps). Pour the batter into the prepared muffin tin, fill each cup about 2/3 full. Bake in the preheated oven for 12-15 minutes or until a toothpick comes out clean. Remove immediately to cool on a wire cooling rack. Serve warm.